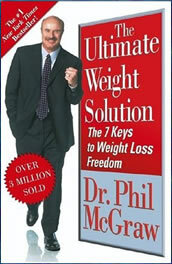 The Ultimate Weight Loss Solution is the creation of television personality and psychologist Dr. Phil McGraw. Dr.Phil guides readers in a process of learning the reasons why they overeat and sabotage their weight loss attempts. The major focus of the program is identifying these issues and then working on resolving the emotional and psychological obstacles to weight loss. Once this process is set in motion, dieters then shift the focus onto the dietary principles that will assist weight loss, such as limiting portion sizes, selecting healthy foods and becoming involved in a regular exercise program. In this step you identify negative thinking about yourself and your weight loss issues. You learn how to take responsibility for your situation. Here you stop regarding yourself as a victim, take control of your emotions and decide to take action. This involves creating circumstances that will support a weight loss plan such as cleaning out the cupboards to remove foods that may trigger binges. In this step you learn how to prevent eating for reasons other than hunger and nourishment. This step guides dieters through the process of evaluating eating habits and learning how to make healthy choices. You will start to follow a ‘high-response cost, high-yield nutrition’ diet plan that involves eating more foods that are high in fiber and nutrients. You will begin to add exercise as part of your daily lifestyle. This step involves enlisting the help of your family and friends to support your weight loss efforts. It may also involve avoiding people in your environment who may sabotage your results either intentionally or not. Each step is explained clearly and there are case studies, quizzes and charts to assist dieters through the entire process. The dietary aspect of the plan is actually very simple. Dieters are encouraged to increase the consumption of higher nutrient and lower calorie foods such as fruit, vegetables, proteins and whole grains while limiting the intake of calorie dense foods such as pastries, desserts and fried foods. Recommended foods include fruits, vegetables, low fat dairy products, seafood, poultry, meat, eggs, whole grain cereals, pasta and breads. Look here for other healthy meal ideas. There are no specific exercise recommendations. Dr.Phil advises dieters to find an activity that they enjoy and to be involved in some form of physical activity every day. Dr. Phil also emphasizes the importance of exercise for long-term weight control. These exercises could be used with this plan. The Ultimate Weight Loss Solution retails for $7.99. Dr.Phil has also published a food guide which retails at $7.99 and a cookbook which retails at $26.00. Dr.Phil also recommends the use of nutritional supplements including a multivitamin, vitamin C, vitamin E and calcium which may increase the cost of following this plan. Addresses the psychological reasons why people have difficulty losing weight. Encourages dieters to set realistic weight loss goals. Do not need to completely eliminate favorite foods (although these may need to be restricted to a large degree). Does not require a large amount of time for food preparation. Advocates regular exercise as part of a weight management lifestyle. Results may take time, especially while dieters are working through the initial stages of the plan that focus on psychological issues. Will not be as helpful for dieters who are not as greatly affected by emotional and behavioral factors. Requires the use of supplements. The Ultimate Weight Loss Solution is most appropriate for those who feel there are psychological issues that are affecting their ability to lose weight. It is tailored towards long-term results by changing attitudes and behaviors. The dietary aspect of the program is based on common sense principles that will promote healthy weight loss and in addition to the recommended exercise this is a well-rounded plan that will assist dieters to create a lifestyle that will support long-term weight management. i want to try this diet,because my weight is already obesity.but there is guarantee for this solution?with the different way of diet we can loss my weight?but thanks for solutions. This is an awesome diet!!! and this is the first and only diet that actualy sounds yummy and eatible! we lost a lot of weight and we just wanted to say thanks. THANKS!!!!!!!!!!!!!!!!!!!! !